GREAT FUN: The kids foam sports balls make the perfect pastime activity for a rainy day at home or school recess playtime. Excellent size for most standard foosball table games. HIGH RESILIENCE DESIGN: Mini foam sports balls are suitable for squeeze to relax stress. SOFT AND DURABLE MATERIAL: Foam sport PU balls will never hurt your children but improve their grip strength. KID'S PARTY FAVOR: Mini sports balls are perfect party favor for the sport fans. PERFECT GIFT: Mini foam sports balls are perfect presents for kid who loves sports. 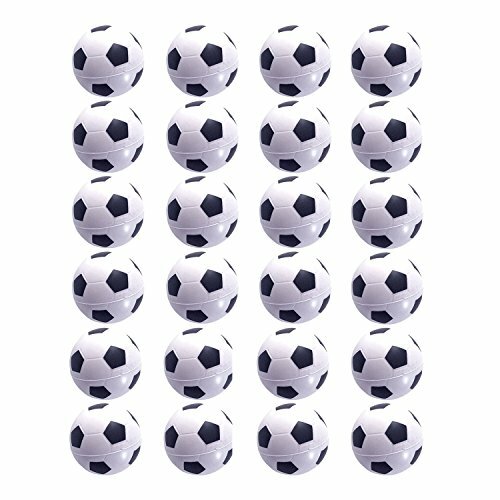 PACKAGE: One package includes 24 packs black and white mini soccer ball. GREAT FOR ENTERTAINMENT: Children will have fun to throw and squeeze these mini squeeze balls. PERFECT FOR SPORTS THEME PARTY: Foam sports balls are perfect for sports theme party. SIZE: Measuring 1.57 inches (4cm) in diameter. If you have any questions about this product by MOMOONNON, contact us by completing and submitting the form below. If you are looking for a specif part number, please include it with your message.